A standout feature of this project is a large central courtyard elevated on Level 2, encouraging community interaction. 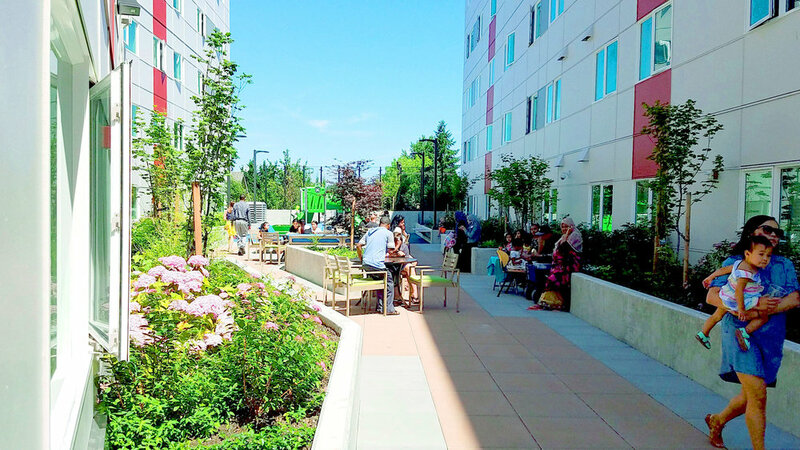 A large community gathering space at the south end of the courtyard highlights views to the busy area of the Othello Light Rail Station and a play area at the north end provides a safe outdoor space for children. A bioretention planter with greenscreen and climbing vines on the north side creates a wind screen and enhances privacy. A "loop" walking path, and benches ring the courtyard, promoting walking with places of repose. Raised planters with trees and shrubs line the courtyard, creating a buffer between the units and the courtyard. At the street level, the southern entry plaza takes advantage of the open space to the south. A planting strip, salvaged and new street trees, and raised planters along the building façade provide a buffer from the heavy traffic of MLK Jr. Way S. A planting strip with small trees and climbing vines on greenscreen soften the façade at the alley.